Narcissus lends its name to Jean-Claude Ellena’s new Eau de Narcisse Bleu, an unusual interpretation of the cologne theme that rubs a raspy, bitter texture against a soft orange blossom note. Gardenia is trending, and we’ll see more of it in coming months. The latest addition to the canon is Bertrand Duchaufour’s Gardez-moi for Jovoy, a queenly exotic under her cool creamy retro vibe. Jasmine from Calabria features in Cour des Senteurs, the super-exclusive, one-location-only Guerlain composed by Thierry Wasser for the brand’s new boutique in Versailles. A tribute to Marie-Antoinette’s favorite flower (or so we’re told), this is a fresh take on the flower, delicately threaded into a garland of muguet. Carnation is a note that’s pretty much MIA as far as contemporary perfumery is concerned. In Wilde by Jardin d’écrivains – a French brand dedicated to famous writers’ gardens --, it spices up the fig and mossy woody notes of this tribute to Oscar Wilde in his more youthful period, when he was inspired by Ancient Greece. Ylang-ylang is seldom showcased in a composition – often a bridesmaid, never a bride. With Ylang 49, Le Labo matches it with tiaré in an intriguing composition by Frank Voekl: a tropical floral chypre tugging the salty facets of the flowers into an undergrowth of moss. Great compliment magnet. Lily may be the flower of the Virgin and of French royalty, but Serge Lutens has gone medieval on it. Vierge de Fer, a tribute to Lutens’s mother, goths it up with a cold green metallic note. The Iron Maiden has just been presented to the press and is due out in September: I’ll get back to it more fully closer to launch date. Magnolia is the theme of Grandiflora, the first scent of a new perfume brand created by Saskia Havekes, a cult floral stylist based in Sydney. And it is a very rare treat indeed, since it was composed by none other than Sandrine Videault, who last gave us the stunning, radical, Manoumalia. The secret gardens of Venice have inspired AbdesSalaam Attar’s Venezia Giardini Segreti for La Via del Profumo, a haunting blend of jasmine, rose, herbs and ambergris that is just a joy to behold. A mes lecteurs francophones : je traduirai ceci sous peu, désolée d’avoir un temps de retard ! N’oubliez pas le tirage au sort d’un flacon de Séville à l’aube, ouvert pour toutes les personnes ayant acheté Parfums, une histoire intime et résidant en France. 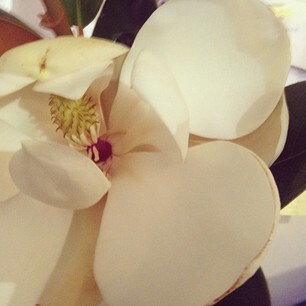 Illustration: Magnolia grandiflora picked off the Iphoneogram account of Grandiflora Sydney. This post got me daydreaming! An interesting and spellbinding flower garden! I'm very intrigued by the two new Le Labo. This non-spring I also favored mainly floral compositions - but don't I always? Zazie, I was so spell-bound by Ylang 49 I neglected Lys 41, but I'm sure I'll get back to it! Here in Paris summer has come at last... for the past two days! Last night the flowers on their tender stalks came to my door and gave me a robe of white silk. I asked them to stay, but the rain on their petals was already drying. I wore the robe for the evening, and most of the next day. Then I spread it over the threshold of my door and waited. The next morning, the flowers on their tender stalks had left a child. Her name was Falling into a River. I know one day she'll leave, but until then we eat soft pears and play with the dog. Stefush, what else can I say but thank you for your poem? It's beautiful. Thanks, Denyse. It is my response to the fact that Gardenia is trending right now. And aren't we happy it is? I suppose - I just have so many other, older ones to sample still. Not to mention ylang ylang. 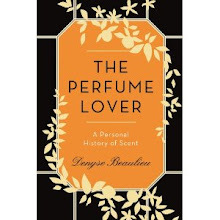 Sometimes being a perfume fan is like wanting to buy your lover a rose, and going to the florist only to have the shop owner usher you into a room where every single possible flower petal is swirling around in a blinding rush and asking which one you prefer for mademoiselle? I know. That's why I've given up on trying to sample everything. I rely on that little extra jolt that draws me to something specific, and that unforeseeable moment of silence that allows me to listen to a scent. Only then does the connection occur. It can't be forced (otherwise I would be an evaluator and do it for a living). Ah, but you've been in the game longer than I have. I'm still rapacious about it; I'll huff anything as long as it isn't found on the counter at Macy's or in a gatefold ad of a magazine. See, but Paris is the BEST place on Earth to not notice things. It's the only city I've ever visited where you can sit at a café and no one will bother you for an entire afternoon. I did some of my best writing there. Hm. I wouldn't say you don't notice things -- the city is a constant spectacle. I think it's basically café waiters trained to respect someone who's writing. Quite a long tradition for it! This weird spring- summer has deprived us of the right amount of flowers- smelling! Jasmines have been watered to death, now they're fading and only sometimes you can breathe a whiff of their fragrance... I haven't smelt a linden or a magnolia, yet! I'd love a good magnolia scent, none of what I've tested up to now features a proper magnolia to my nose! Waiting for your reviews! Iodine, I know, it's been very frustrating! I wore Sandrine Videault's Magnolia today, and it seemed quite faithful to the magnolia "vibe". 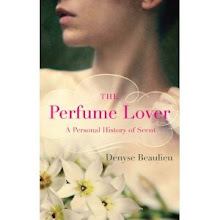 Though of course composing a fragrance to be worn on skin is not the same as reproducing the exact scent of a flower. Nozknoz, the magnolia blossoms are gone here now... I'd have loved to compare. I'm so glad Sandrine is putting out something new. It's been a long time! I'm late to this thread but I'm intrigued by the upcoming Lutens Lily. I'm a diehard Un Lys fan. Your Erzebeth Bathory tease makes me think its iron is tinged with blood. I must know - is there amber in the new Lutens? Gris Clair, Cuir Mauresque are both lovely to me on paper, but the "amber" used in Lutens smells like sweet fat on my skin - I can't wear even his Bas de Soie for this reason. Un Lys: amber-free. If you tell me there's no detectable amber in Vierge de Fer I will lem all summer. Thanks for the info, De Profundis is a regular in my rotation to I'll hunt this one down when it's released. Lys, what they share is a cool, unsettling quality... But I need more wears before I go any further into it.